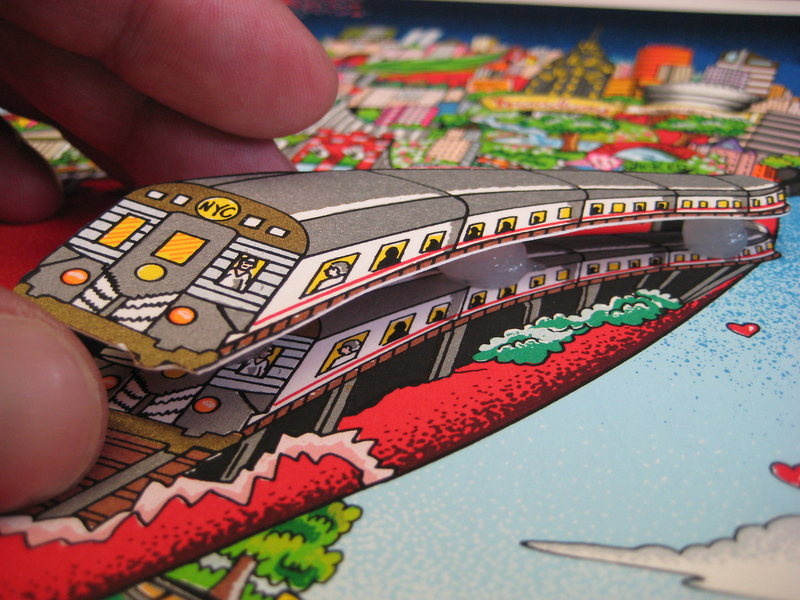 What does it mean when we say that Charles Fazzino’s pop art is three-dimensional? Everyday, Fazzino faces the challenge of trying to show people and explain what 3D means. 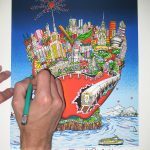 His imagery is rich, colorful, and detailed but until you see it in person, you don’t necessarily experience the “WOW” factor produced by his hand-cut, assembled, and embellished 3D technique. 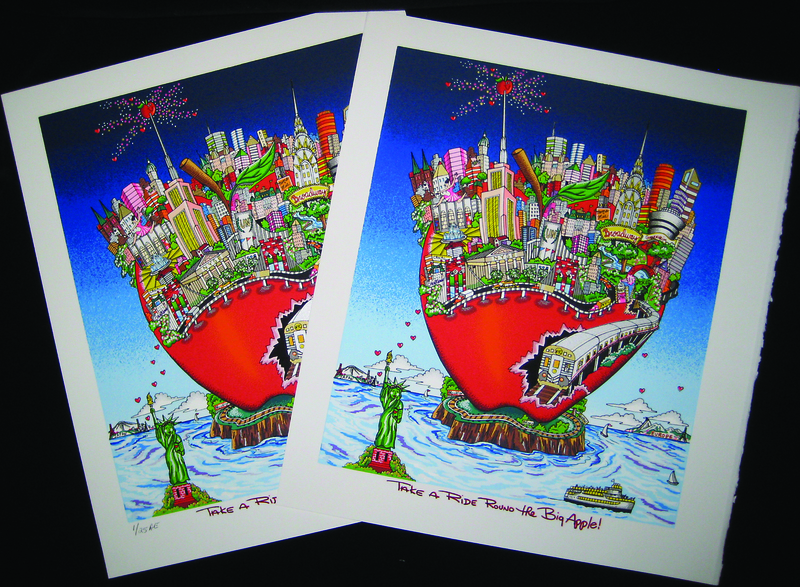 Fazzino’s limited edition artworks are silkscreen printed (see below) multiple times on two different weights of 100% rag museum board. The bottom layer is printed on a 2- or 4- ply board, giving it the stability it needs to support the layers. 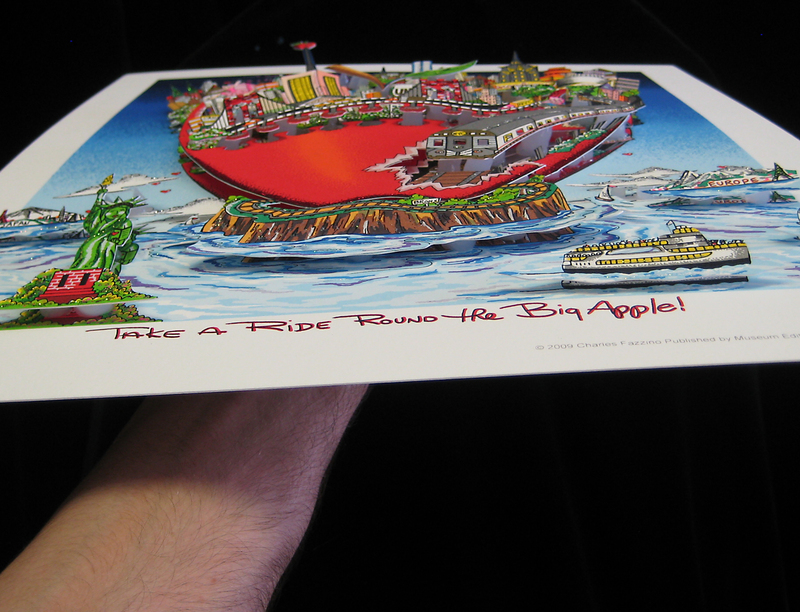 The top layer(s) is printed on 100% rag museum paper thin enough to cut but sturdy enough to sit on top of the glue used to layer the artwork without bending. 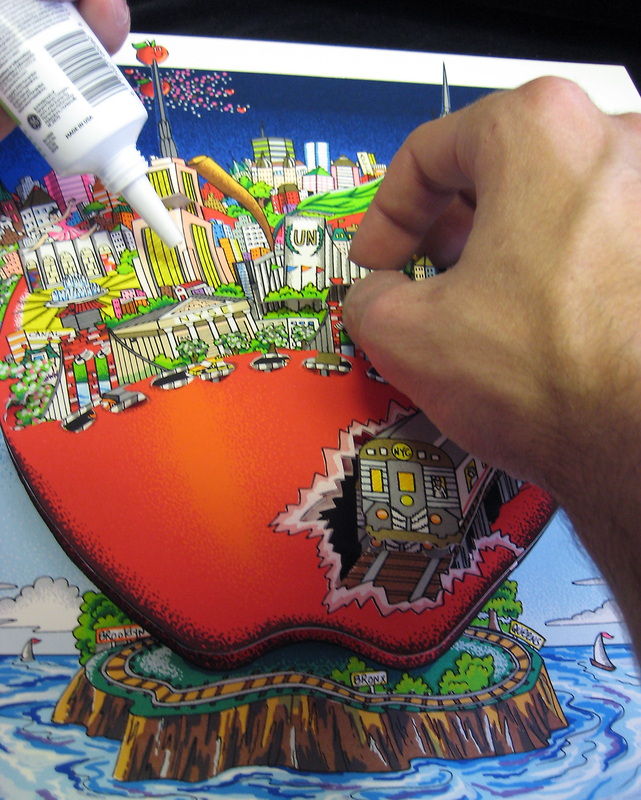 All of the individual pieces that make up the 3D layers of artwork are cut out by hand using an exacto knife. 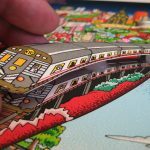 Because of the incredible level of detail captured in the cutting process, people often erroneously assume the prints are either die-cut or machine-cut. The cutting process is carefully planned out and highly artistic, achievable only by the most skilled artisans trained for hours in Fazzino’s methods and techniques. 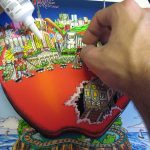 The artistry in each Fazzino work is created as much by the 3D process as by the composition itself. 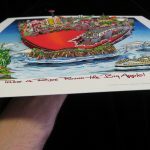 All of the details are cut out of the top-layer cutout sheets and are matched up with the accompanying imagery on the bottom-layer boards that are signed and numbered. 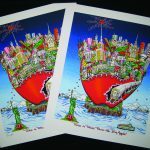 Charles Fazzino experimented for many years to find a material suitable for layering the artwork. 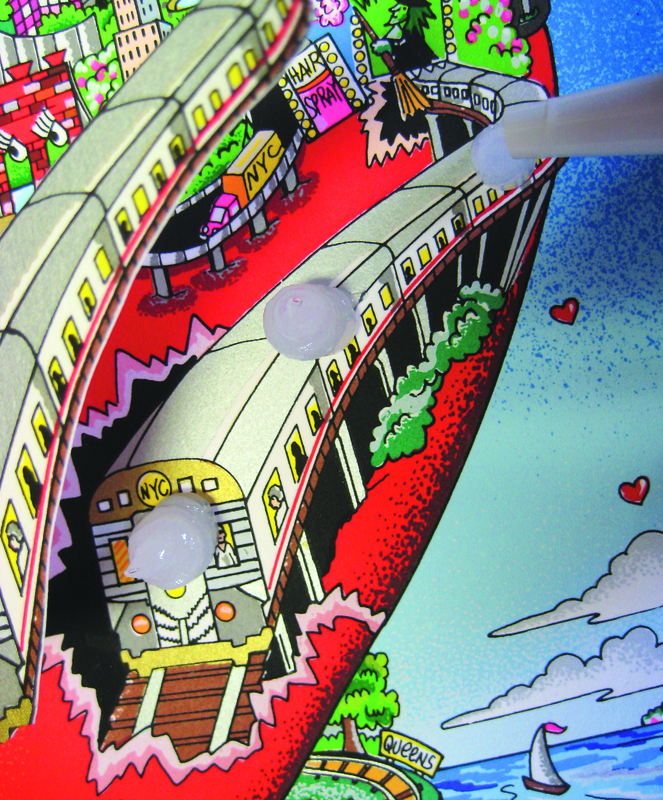 He settled on a special silicone because it gives him the flexibility to alter the depth of the artwork by varying the size of the dollops of glue. A piece of art might only have two or three distinct layers of art, but because of the variation in the height of each dollop, the artwork may appear to have four, five, or more layers. The pieces are also glued slightly off-center to emphasize the 3D effect. 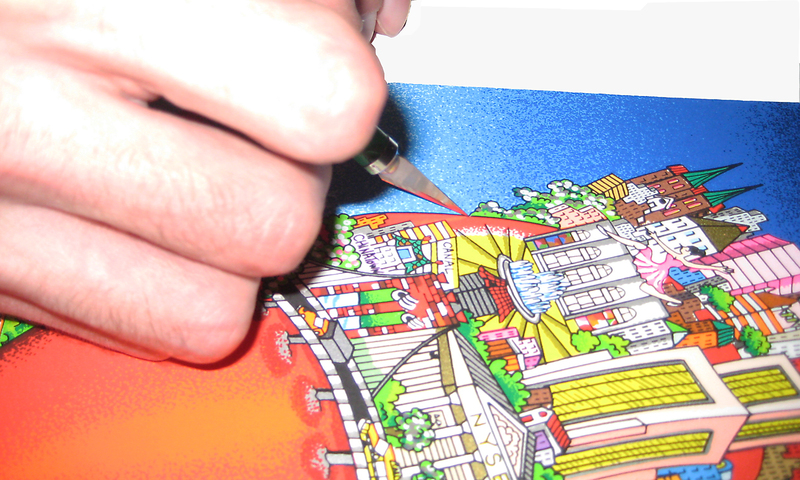 Once glued, each piece of artwork takes twenty-four hours to cure completely. After the artwork is made 3D, it is hand-embellished using acrylic paint glitter and Swarovski crystals. 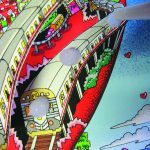 According to Charles Fazzino, “the use of the glitter came about because I needed something to cover up my cutting mistakes. I started using it and it added some glitz to the work, so i kept using it and now it’s a staple.” Each Swarovski Crystal is applied by hand. 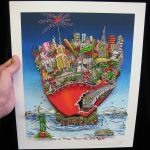 The majority of Charles Fazzino’s fine art prints are made using a hand-stenciling printmaking process commonly referred to as silkscreen serigraphy, or silkscreen printing. 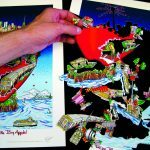 Silkscreening gained popularity in the 1960’s with the explosion of the pop art movement. 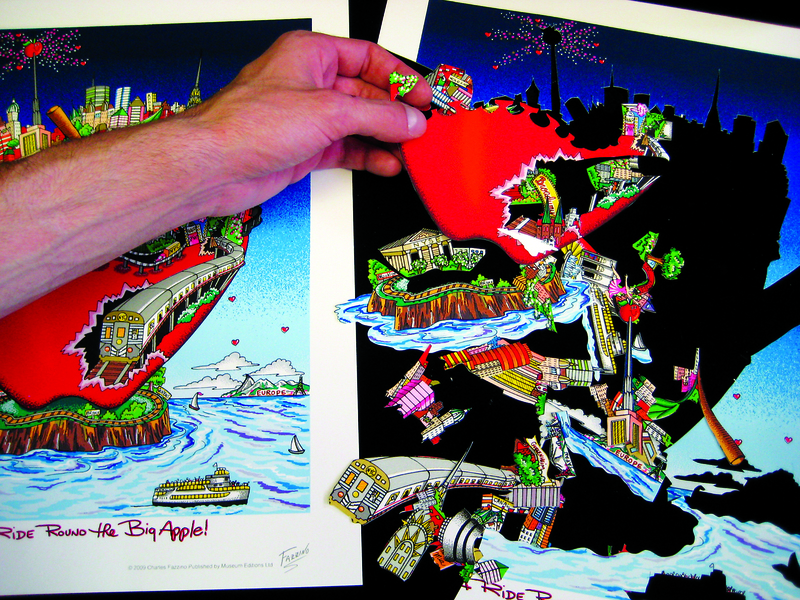 Revolutionary artist like Andy Warhol and Robert Raushenberg gravitated toward the silkscreening printing technique because it allows for bright, bold, and true colors, all of which were crucial to their particular styles. 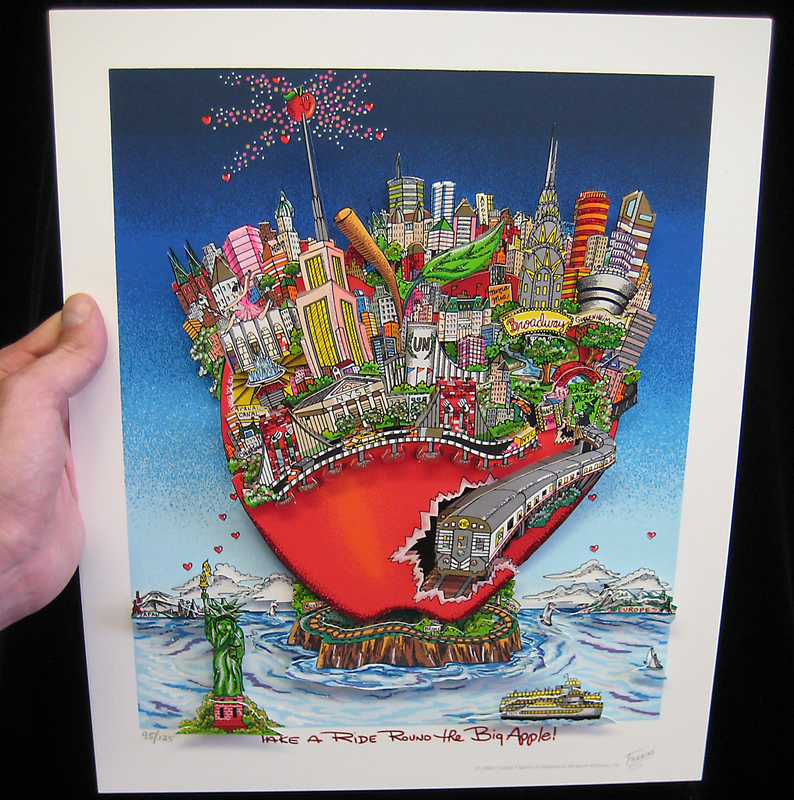 Charles Fazzino began making silkscreens of his original works in the late 1980’s. The fine art printer traces over the original line drawing on a piece of mylar, and tehn creates a screen to e used for printing. Black ink is pushed throgh this screen on a hand printing press to create the black line of the drawing on paper. The black line is sent back to Fazzino to indicate color. 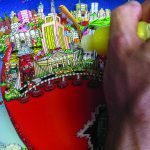 Depending upon the subject and the artistic feel he’s going for, Fazzino will use anything from colored pencils to acrylic paint to indicate his chosen color scheme. The colored black line returns to the printer where the chromists (color separators) translated each color onto a separate screen. Each screen is placed one-at-a-time onto the press during which time the appropriate color ink is applied and squeezed through the screen onto each piece of paper. 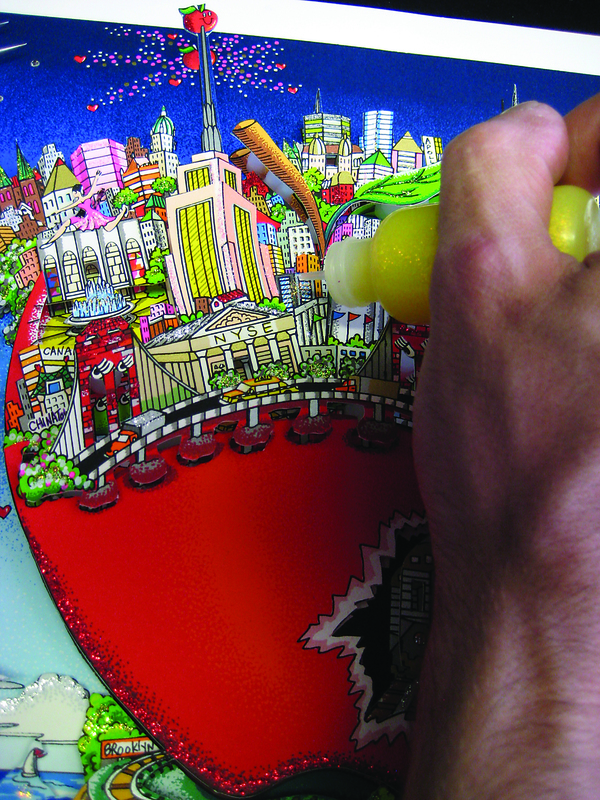 The final image begins to appear as one color is laid down on top of another. 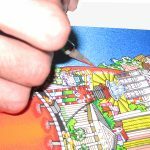 The printer carefully orders the colors to achieve certain blends, effects, more colors, and subtleties in the final print. The entire process consists of hundreds of pieces of museum board and paper being drawn through a hand printing press an average of 20 times each. 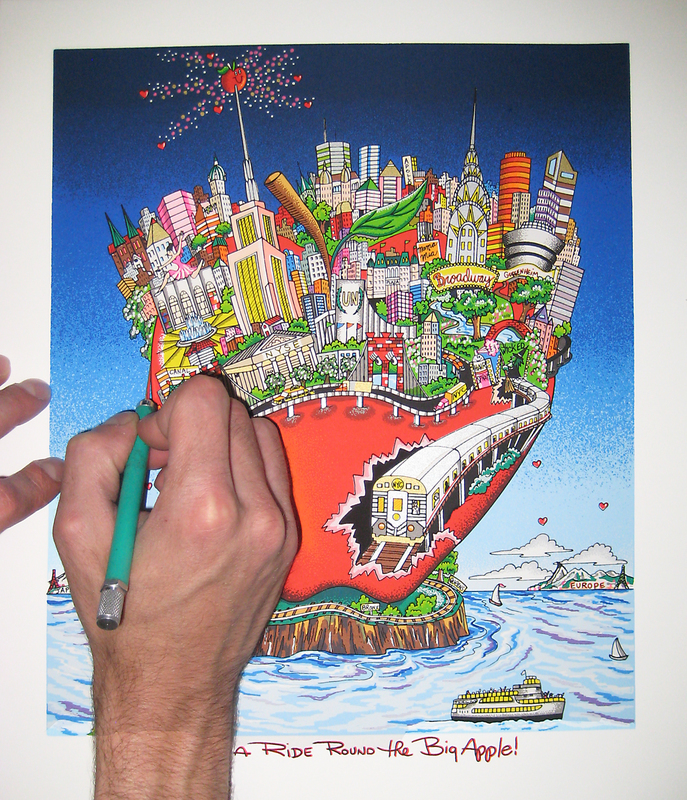 It takes 4-6 months to print an average Charles Fazzino silkscreen edition of artwork.